On weeknights, restaurant-bar Timbre is known for its rock-and-roll roster of live performers, drawing a post-work yuppie clientele hoping to unwind over a couple of pints. 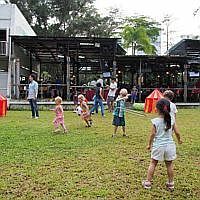 On Saturdays at the Gillman Barracks outlet, Timbre's high-decibel adult setting transforms into a family-friendly haven, complete with a giant bouncy castle, mini tents, toys and art and craft activities. Introduced in late 2013, its barbecue bash Saturday Social BBQ is the Timbre Group's answer to families who want to enjoy a good meal or beer while the kids are occupied with fun and games. As many parents know, eating out with children can be challenging because little ones are easily distracted, since their idea of fun does not involve sitting still at a table for prolonged periods of time. But Timbre, like several other restaurants, cafes and bars, are now rolling out the red carpet for families with not just kids' menus, but kid-friendly facilities, usually at no added cost. Think plunge pools, colouring corners, ball pits - features that won't be out of place in a kids' party or play outing. At SandBank, a restaurant-bar in Parkland Green in East Coast Park, a 15m-long plunge pool allows kids to splash around while their parents eat. Opened in November, the eatery is managed by the same folks behind The Bank Bar & Bistro in Shenton Way, another restaurant that has a mini slide and ball pit on the weekends. 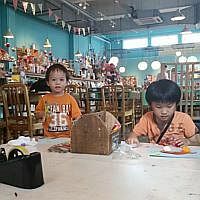 At EatPlayLove Cafe in Kampong Glam, arts and crafts activities are the draw. The 1,700 sq ft space has two craft corners with an array of materials including markers, empty egg cartons and ribbons. Up to 30 children can sit at the corners for a fee of $5 an hour on weekends and two hours on weekdays. For parents who want a more interactive dining experience for their kids, there is make-it-yourself pancake joint Slappy Cakes at The Grandstand on Turf Club Road and Resorts World Sentosa. With a pancake griddle built into each table in the restaurant, the kids can have a go at preparing their own pancakes, under the supervision of their parents. Demand for these spaces is growing. At Gillman Barracks' Timbre, for example, its Saturday Social BBQ had gone from a monthly affair since it started in October 2013, to a weekly one in May this year. Ms Low Seow Yee, music and marketing manager of the Timbre Group, says: "Many of our loyal customers who were with us right from the start have now entered the parenting stage, a phase in their lives where they find it more challenging to kick back and catch up with friends over beer. "We want to allow couples to enjoy quality time with each other or friends without having to worry about their kids." At the Treehouse Cafe at The Grandstand which has a play area designed like a treehouse, business has doubled since it opened in 2013 with families making up 90 per cent of the customer base, says co-owner Ms Carin Tay. For parents, these places are a godsend. Take housewife Zoe Wong, 43, who has been to EatPlayLove Cafe twice this year and plans to go more often with her six-year-old son Allen. She says: "Kids usually get bored when you take them out to restaurants after eating as they can't run around, but at EatPlayLove Cafe, my son is kept busy with the crafts while I can enjoy a drink in peace." For accounts manager Jennifer Tey, 38, taking her six-year-old son and four-year-old daughter to family-friendly eateries like bar-restaurant District 10's UE Square outlet at least once a month allows her to catch up with her friends who are mothers and take along their kids too. 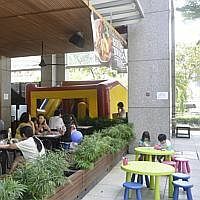 The restaurant-bar sets up a bouncy castle, small rides and colouring materials on the weekends and public holidays. "The kids are kept occupied so I need not worry and I can enjoy my brunch with friends or family." Yet with kid-friendly spaces come the added challenges of maintaining high safety and cleanliness standards, as well as appeasing the non-family customers too, restaurant owners note. Ms Tan of EatPlayLove Cafe has noticed that some office workers are so turned off by the rowdy kids that they avoid them during school holidays. Otherwise, they prefer to go on weekday evenings. To minimise disturbances to other customers, some restaurants have clear demarcations for play areas. At the Treehouse Cafe, couples and office workers are seated further away from the play area, says Ms Tay. The toys and books are sanitised regularly, too. Play facilities aside, the food has to ultimately be appealing to both parent and child. Marketing manager Shawn Wong, 32, stumbled upon the Treehouse Cafe last Saturday while at The Grandstand with his wife and two-year-old daughter. In general, he feels that family-friendly restaurants should serve good food. "If I wanted sub-par food, I would have just taken my child to a play centre instead." He adds that he enjoyed the restaurant's selection of Asian and Western fare, while his daughter Ellen amused herself at the play area "instead of being bored at the table". It is never too early to get the little ones cooking. At Slappy Cakes, kids can get creative and make pancakes in any shape or size on a griddle built into the table. A plunge pool is a surefire way to attract kids and SandBank has a 15m-long one, spanning the front of the restaurant-bar. Divided into two sections, two-thirds of the pool is at a height of 90cm while the remainder is at 50cm to cater to children of different ages. In this quaint cafe with turquoise walls and striped wooden tables, children can get crafty with an array of materials such as colouring pencils and markers, pasta shells, ribbons and paper plates. To get access to these craft corners, parents have to pay $5 an hour on weekends. On weekdays, the same amount gets you two hours. Kick off the weekend with a barbecue party at restaurant-bar Timbre's Saturday Social BBQ at its Gillman Barracks outlet. The kids can run around in a small field next to eatery, play in a colourful bouncy castle or smaller tents and get crafty with arts activities. There is a theme for every month. Come June, it will be Arabian Nights complete with a snake charmer. 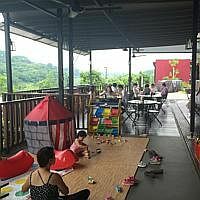 After taking a walk or cycle along the scenic Punggol Waterway, families can grab a bite at this cafe, which has a play area fitted with child-safe mats, castle tents, rocking horses and building blocks. Menu highlights: Signature items are the eggs benedict with smoked salmon served on a waffle ($13) and duck and lychee pizza ($17). Though there is no kids' menu, parents and children can share the macaroni and cheese ($12.80) or ham and pineapple pizza ($16.80) - items no kid will say no to. Open: 3.30 to 10.30pm from Tuesday to Friday, 9.30am to 10.30pm on weekend. Closed on Monday. A weeknight hangout spot for workers wanting a drink after a long day, this restaurant-bar morphs into a family-friendly space on the weekends, complete with a bouncy castle, special rides and colouring material laid out on soft pads lining the playzone. With a play area designed to look like a treehouse, you can see how this cafe got its name. Starting next month, there will be a roster of free kiddie activities every last Sunday of the month. These include art and craft workshops, or balloon-sculpting and face- and hand-painting events. Ad-hoc workshops starting from $20 a session are also available, where kids can learn skills such as making a terrarium or building animals with Lego bricks.